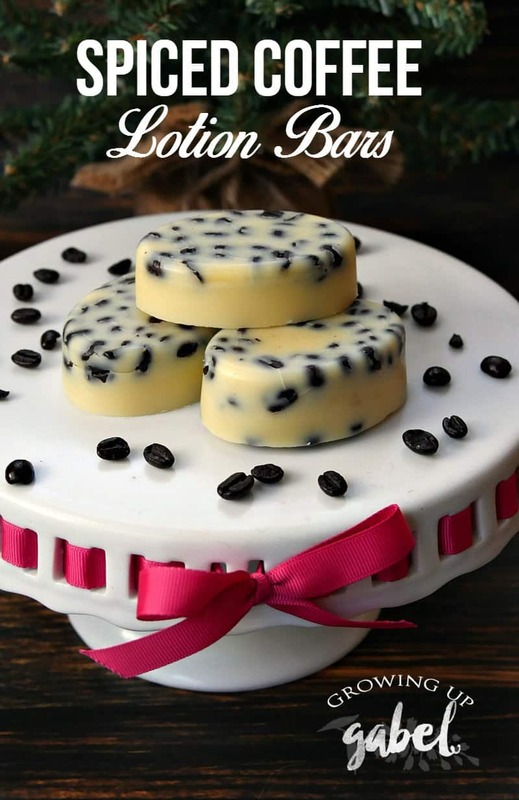 Coffee beans and spice make hard lotion bars smell delicious and great for skin. 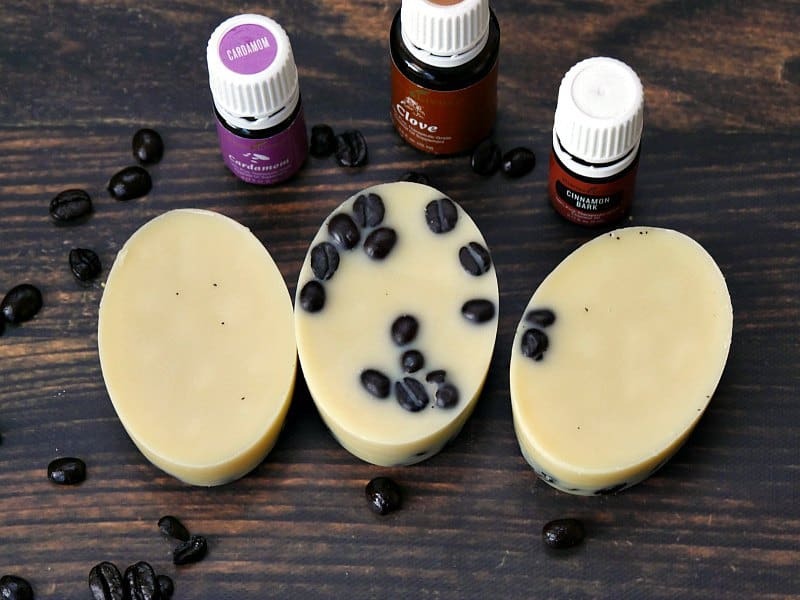 While I was making a batch of cinnamon and clove lotion bars, I kept thinking that a coffee hard lotion bar would smell delicious with the cinnamon and clove. 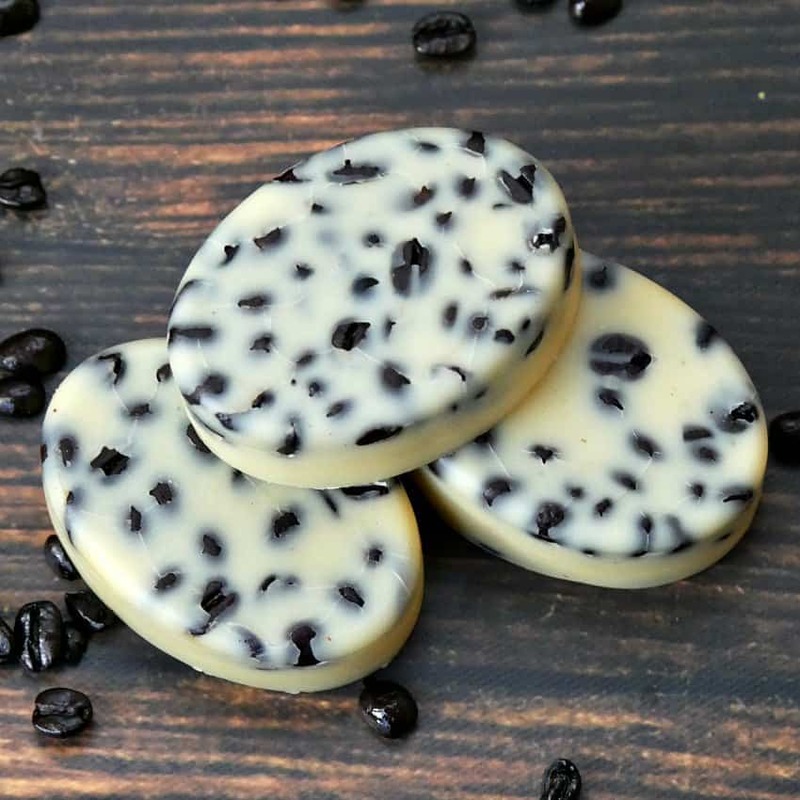 The coffee beans on the top of the lotion bars would help exfoliate the skin to help smooth away rough skin. And since lotion bars are so easy to make, I whipped up a batch! Shea butter or cocoa butter – I used cocoa butter for these instead of shea butter. The cocoa butter is less tacky, but it does have it's own scent. Shea butter doesn't have any scent. But I still think I prefer the cocoa butter overall. Refined coconut oil – unrefined coconut oil smells like coconuts, which is delicious, so you can use that too if you want that scent in the bars. 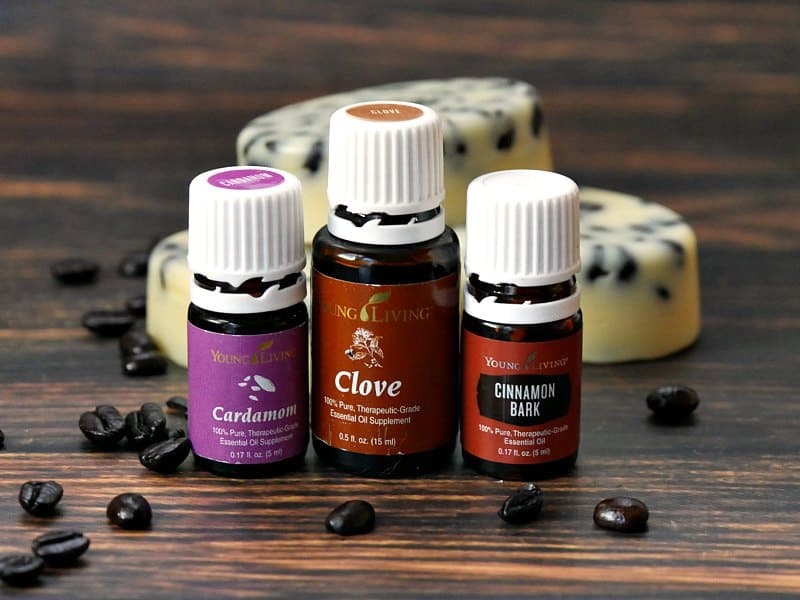 Cinnamon, Clove and Cardamom Essential Oils – I love, love scent of cardamom and I love Cardamom Coffee, but it's not a necessity! Use whatever oils you love and smell like coffee to you. 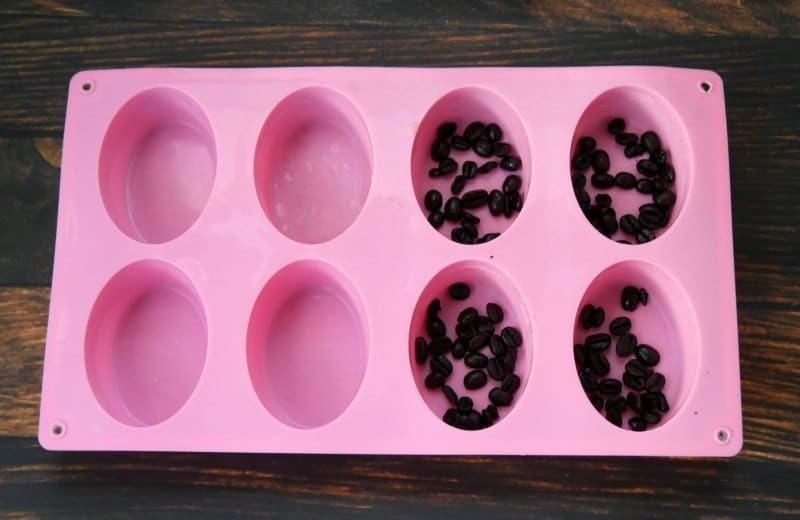 Prepare the molds by putting coffee beans in a single layer on the bottom of the molds. You could also add a cinnamon stick or whole cloves or cardamom pods. 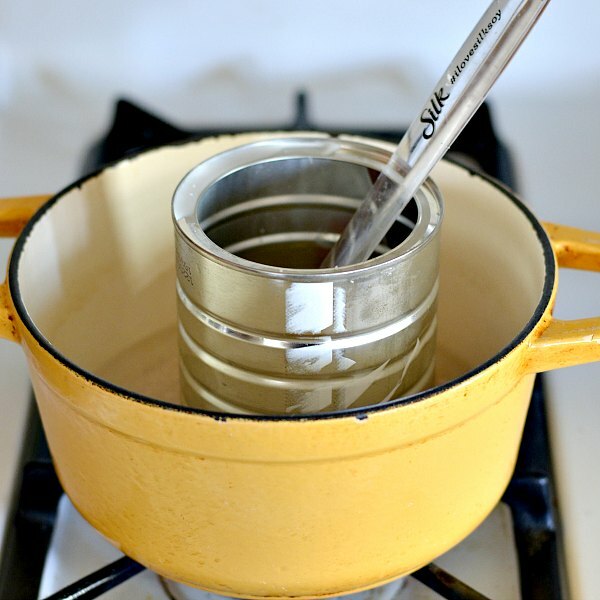 Melt together equal parts of the butter, coconut oil, and beeswax in a double boiler. You can check out how I use a double boiler for candles – just use the lotion ingredients instead of the wax. I used 1/2 cup of each ingredient and it made 4 of the oval bars filled about 2/3 of the way full. The beeswax will take longer to melt than any other ingredient. Add that to the coffee can or other melting container first so it's closest to the heat. Just keep stirring, the wax will melt! When all of the ingredients have melted completely, remove from heat. Add in the essential oils. I used 2 drops of each oil for each bar. Pour a very thin layer that just barely covers the coffee beans in to each mold. Return the double boiler to the pot of water to keep it warm and melted. Allow the thin layer to set. This will keep the beans at the top of each bar. In the middle bar above, I just filled the entire mold an the beans floated up. The bar on the left had the least amount of lotion in the first layer and the bar on the right had a little more in that first layer. It's up to you how you want it to look! Once the first layer has set, fill the mold until 2/3 full. Allow the bars to cool and set completely before removing from the mold. 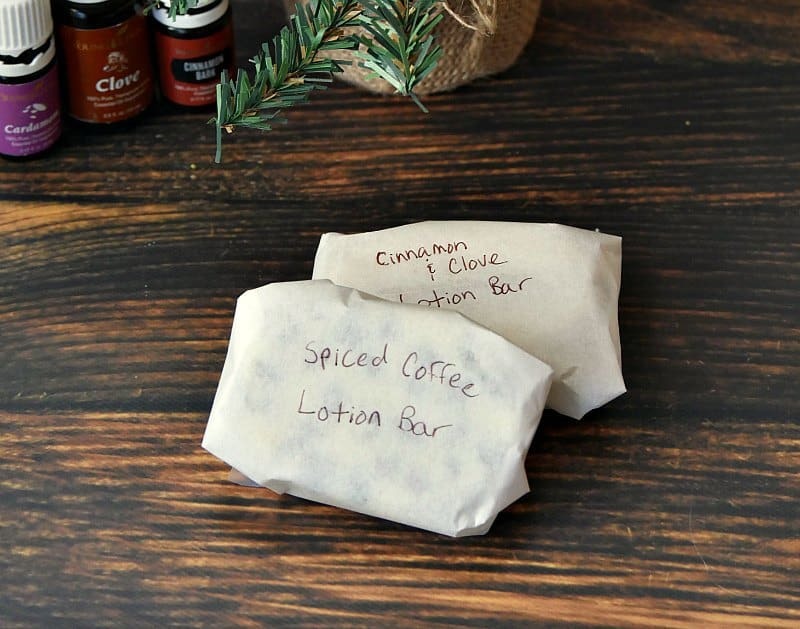 To give the hard lotion bars as gifts, wrap in parchment paper or wax paper. I used parchment paper and wrote the scent on the paper. Or you could make cute stickers for the bars, too. 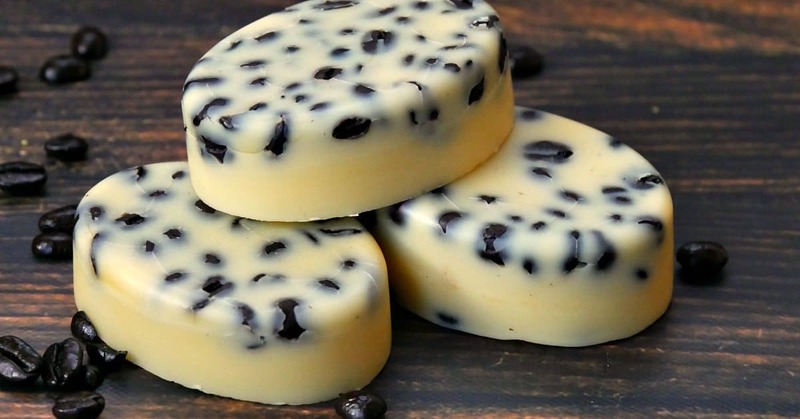 I want to make some lotion bars. I’ve been doing a few other beauty DIYs but, haven’t made hard lotion bars.Thanks for sharin g at the Inspiration Spotlight party. Pinned & Shared. I bet those smell just amazing! They look pretty too, just sitting on a counter. Thanks for sharing this at the DI & DI Link Party. these sound like they would smell incredible!! Thanks for sharing – definitely gonna make them! I want to smell them they look so good!!!! They look so amazing and I bet they smell just as amazing! 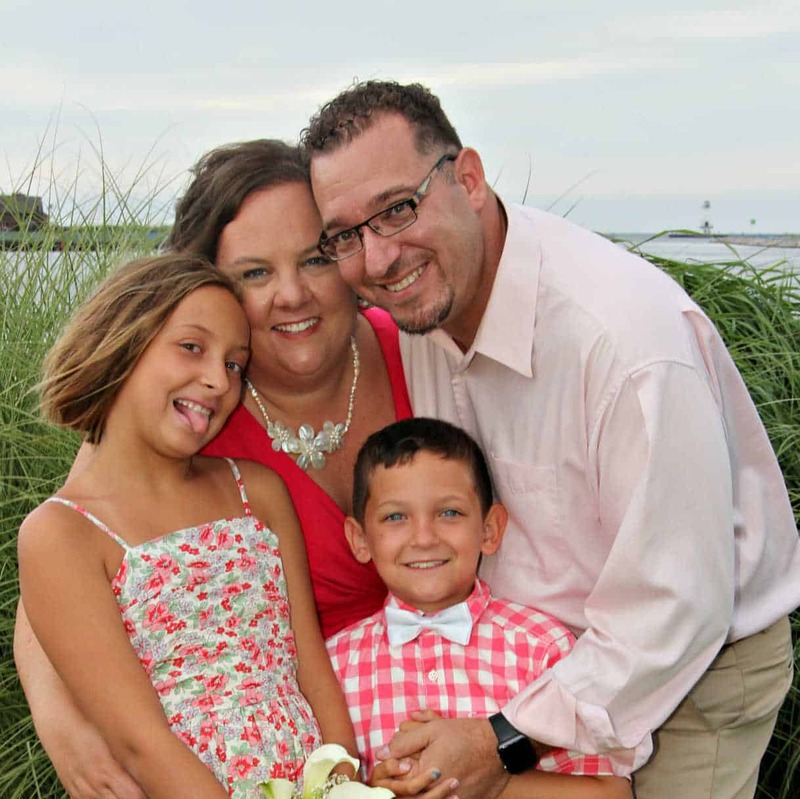 Thanks for linking up at the Family Joy Blog link up Party! Pinned! I love this idea. Now if I could only figure out how to use it. Either I’m too cold or impatient but I can never get it to work other than for my hands. I’d love to use it on my body too. I have a lot of soap molds I use with my girls when they were young and have them put away. I always thought these lotion bars were complicated but you give a lot of detail and great pictures. 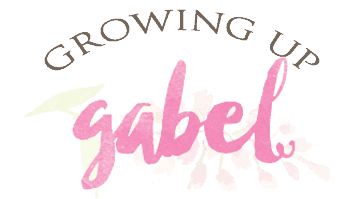 All I need is the beeswax and I am going to dig out the cute molds I have and send to my grown daughters. So super easy! They do feel a bit greasier when going on but it all just soaks up in to the skin. ooo I bet these smell amazing! I’ve been thinking about making soap for Christmas gifts this year, but I wasn’t sure how hard it would be. Your tutorial makes it seem pretty straightforward. Thanks so much!